After receiving a delivery of antiques and furniture from my sister (who downsized from two houses to one, renovated, and redecorated all within the span of a few years), I found myself with many new surfaces, and in need of a few lamps. Over the past few months, I have scoured many wonderful home décor stores around Atlanta and have also visited many online shopping resources. 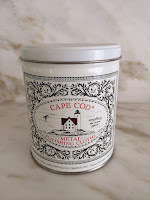 One thing I have noticed: the standard shade that often comes with a lamp is in most cases drum shape (which seems to be the current trend – the top and bottom of the shade is the same size – it looks like a drum, hence the name) or empire shape (where the top opening is smaller than the bottom opening), and is usually a smooth finish. Most of the lamps I have purchased recently come with a shade (linen or paper). The lamp seen above is one I own – it was selected by my designer – and the standard shade that came with the lamp is a drum style. 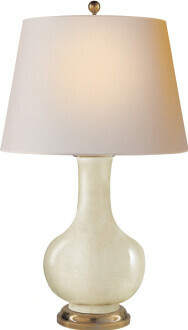 This is one of my favorite lamps, and the shade that comes with it is perfect for the lamp. 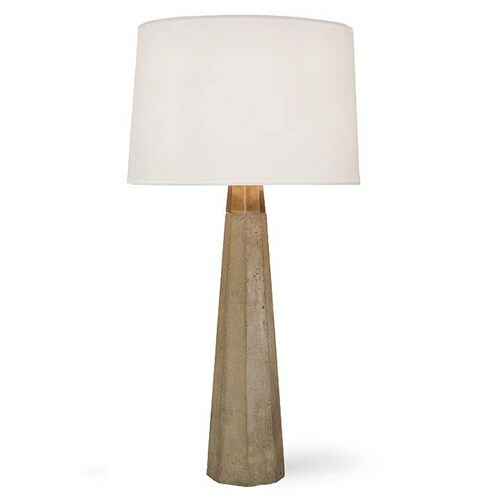 The lamp is made of concrete and has brass accents, and it looks great just about anywhere. This lamp can be found online here. 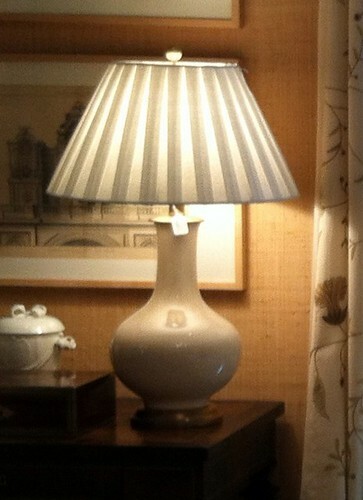 This is a lamp I have frequently admired, from Visual Comfort – it’s a classic narrow neck vase form. The standard lampshade is a nice gentle empire shade whose top is slightly smaller than the bottom. This lamp can be found online here. I also saw this lamp in Mrs. Howard (an Atlanta store owned by designer Phoebe Howard). The standard shade had been replaced by a custom made pleated linen shade, and to me it gave the lamp an entirely different look and feel. This is when I realized that many of the lampshades in my house are pleated . I truly love the look of a nice pleated lampshade, particularly when the shade is made of linen. Lampshades are an interesting topic to research, and there are a lot of opinions out there. When I looked into what designers are liking in lampshades these days, it seems that drum shades and the empire shades in a more streamlined shape seem to fit the more streamlined approach (and lamp style) that some designers are gravitating to these days. With a cleaner lined, simpler shade, the base can be the star of the show. And the opinion on pleated shades? Some say they are not in style right now and to stay away from them, although one source gave large pleats grudging approval. Perhaps this is because pleated shades can be considered very traditional. Ultimately, it is a style and fashion choice, and everyone has their own opinion. 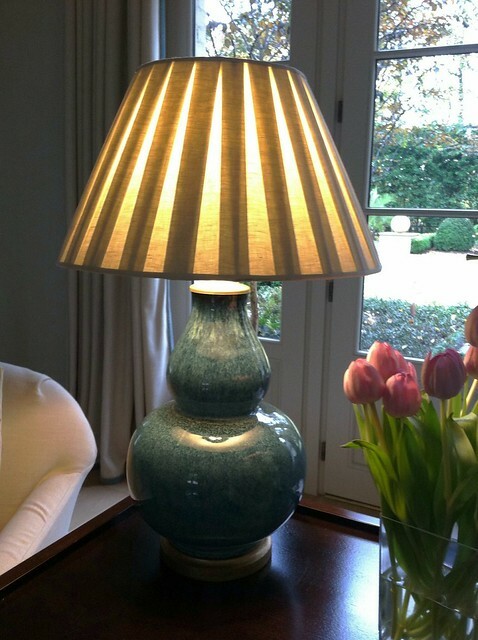 One of my favorite lamps in my own home came from Mrs. Howard. The pleated shade is the perfect touch, and replaced the standard shade that came with the lamp. Personally, I am a die hard fan of pleated shades, particularly the box pleat style that is always featured so prominently in Mrs. Howard and in Phoebe Howard’s designs. I think it is such a lovely detail on a lamp, particularly when the lampshade is entirely fabric (I like linen, but also like silk for dressier areas). The light glows beautifully through a fabric shade. I asked one of the sales people at Mrs. Howard about her thoughts on box pleats lamp shades, and she said that they are a classic, and they have a very custom look as they are typically hand made and not mass produced. 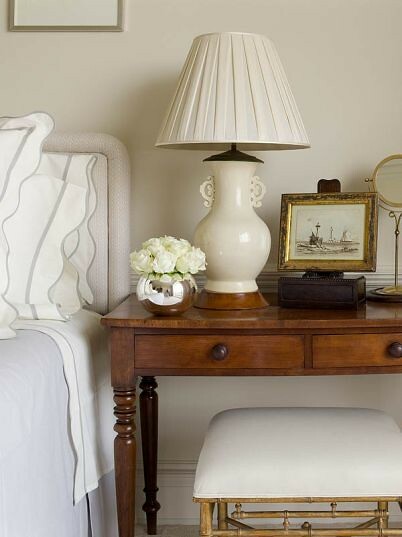 At Mrs. Howard, they often replace the standard shade that comes with the lamp with a more custom shade, and in many cases this is a pleated shade. Perhaps this is why so many of my lamps come from Mrs. Howard (such as the one pictured above, with a pleated linen shade). So here is an ode to box pleat lamps shades. When looking through my files for images, I noticed that once I found a pleated lamp shade in a designer’s work, I often found quite a few pleated lamp shades throughout the body of their work. This could be personal preference, customs of the region, or the shops and craftsmen that a particular designer uses, but I thought it was an interesting observation. Pleated shades always seem to be present in my favorite bedroom pictures. This stunning room was the cover for a recent Atlanta Homes & Lifestyles; interior design by Carter Kay Interiors, photography Emily Followill. Another Carter Kay vignette with my favorite style lamp, and my favorite style shade. 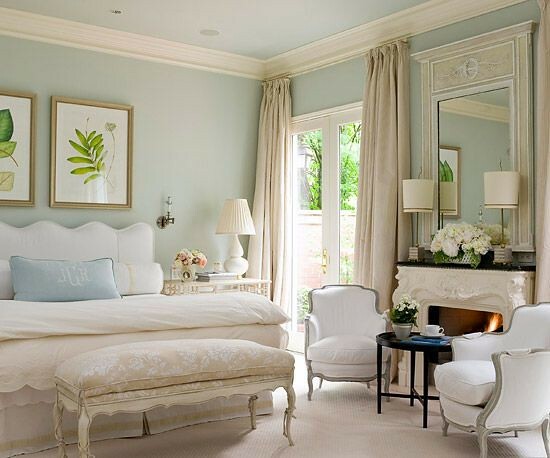 A wonderful and youthful room by Ashley Whittaker. Note the pleated drum shade, which I haven’t seen very often but it is a great look. Image via House Beautiful. A lovely bedroom found on Pinterest. This is one of the prettiest bedrooms I have ‘found’ this year; the soft and soothing color scheme is my favorite for a bedroom, and there are so many charming details – the headboard, the lamps on the mantel, and of course the pleated shades. Source unknown. Circa Interiors often feature pleated lampshades in their designs. I love the look of a pleated lampshade with a crystal or glass lamp. 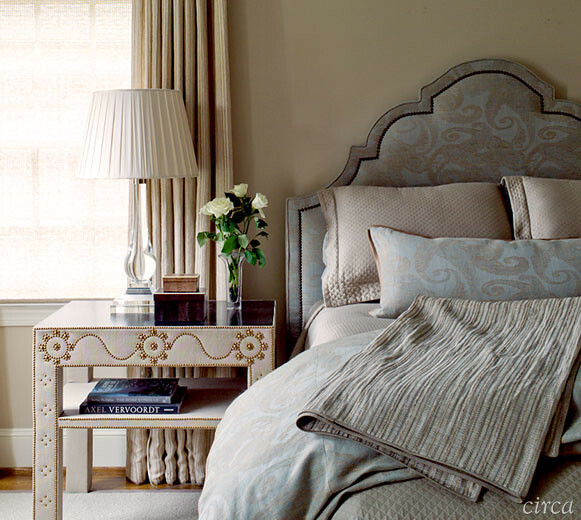 One of my favorite bedrooms of all time, in designer Lori Tippins’ house. The pleated shades are such a great element of the room. Lori worked with the legendary designer Dan Carrithers before she went out on her own, and he was a fan of pleated shades too. 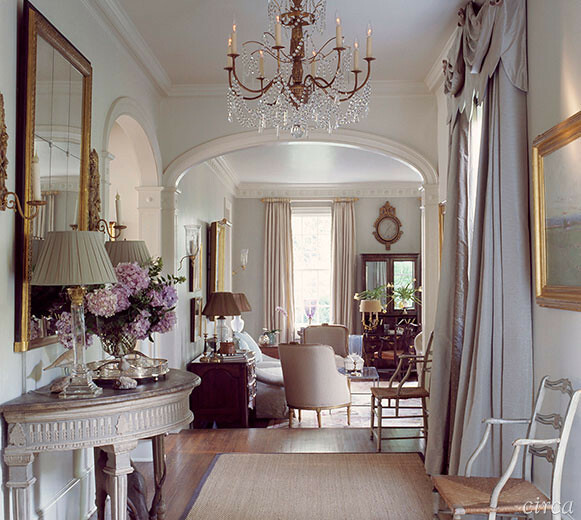 Image via Traditional Home, photo by Emily Followill. The bedroom of a friend is so beautiful – this image appeared on Mrs. Howard Personal shopper, as they did the interior design. Look how pretty the light looks with a pleated shade. These are probably linen. 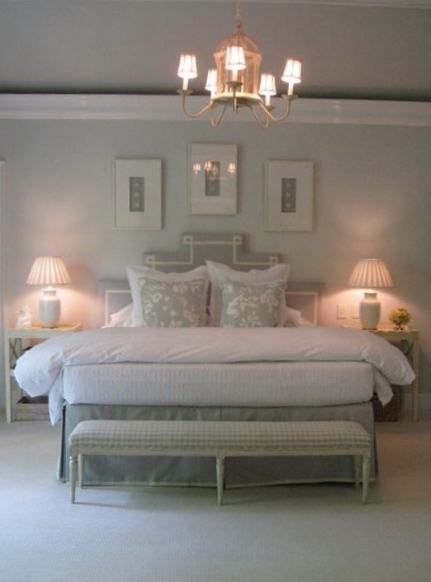 Another beautiful bedroom that appeared on Mrs. Howard Personal shopper. I think Phoebe Howard creates the most beautiful bedrooms, and the soft touches like pleated shades are part of the appeal. 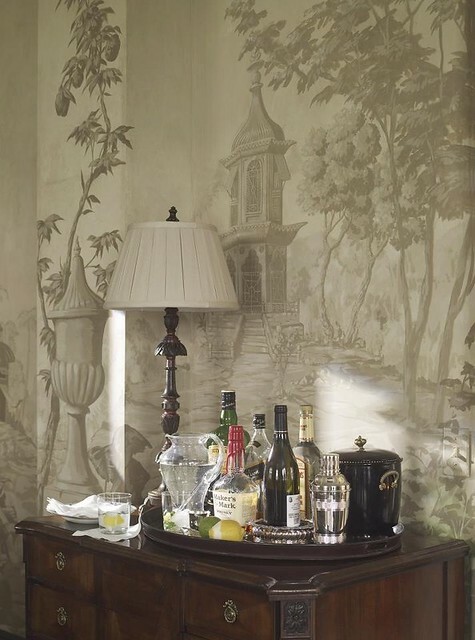 A vignette from Phoebe Howard’s own bedroom, in her Atlanta apartment (since sold). She clearly likes the pleated shade on a personal level, using one with a Vaughan lamp. 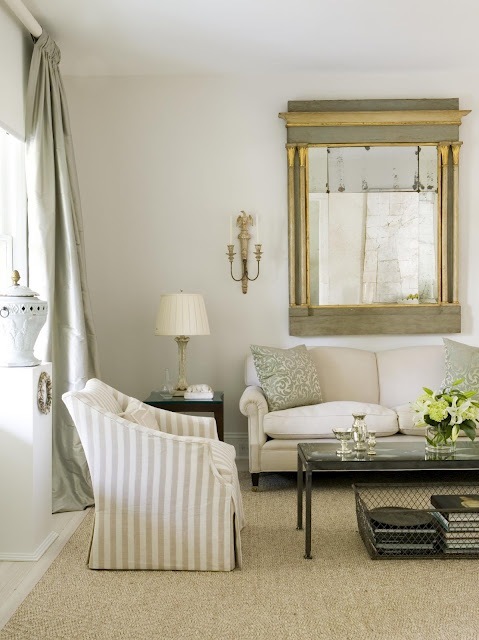 This picture epitomizes what I love in décor today – many contemporary touches such as the art, the floor lamp, and the drum shape of the shade, but balanced with a very traditional architectural envelope and soft touches such as the pleating in the lamp and the tufting on the love seat. Image found on Pinterest, source unknown. One of my favorite Atlanta design teams, Huff Dewberry (who are also Dan Carrithers alums) create wonderful interiors, and pleated lamp shades can often be found in their designs. This vignette appeared in Atlanta Homes & Lifestyles. 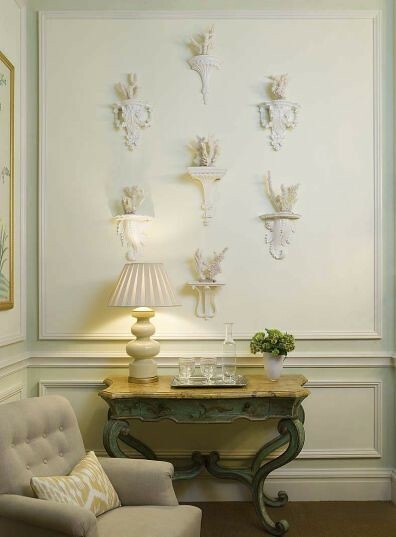 Another vignette from Circa Interiors, which was featured in their wonderful book The Welcoming House. This is one of my favorite design books of the year, and would make a great hostess gift or Christmas gift. 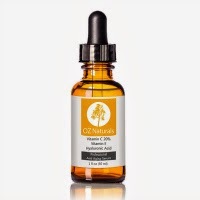 Click here to see it on Amazon. 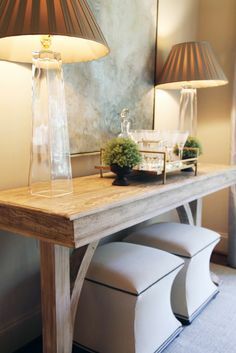 Another image I found on Pinterest, I clearly have a fondness for pleated shades and glass lamps! I think this is such a pretty vignette. I really like the color of the shades, and of course love that they are pleated – it’s an elegant detail. I thought these shades were interesting, as they are pleated but also squared off. Many of my favorite pictures of pleated lampshades reflect pairs of lamps on consoles. It’s such a pretty look. Via Mrs. Howard. Yes, another vignette from Mrs. Howard, but it’s so beautifully composed. Often the pictures are taken with the lamp on, and I love seeing how the pleated linen lampshade diffuses the light. 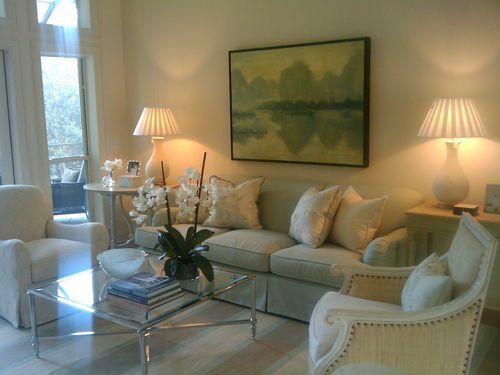 Miles Redd also uses pleated lampshades in his designs, and this picture caught my eye. Windsor Smith also uses pleated shades in many of her designs. I am realizing how much I admire the look of a pleated shade crafted in a custom fabric – these charcoal shades are a beautiful touch. 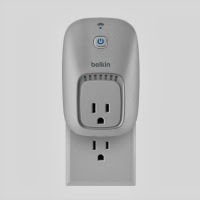 The cords are probably photoshopped out, but I suppose they must plug them in through a floor plug? Note how there is another shade created in the same fabric, on the other side of the room. As a side note, what a magnificent chandelier. 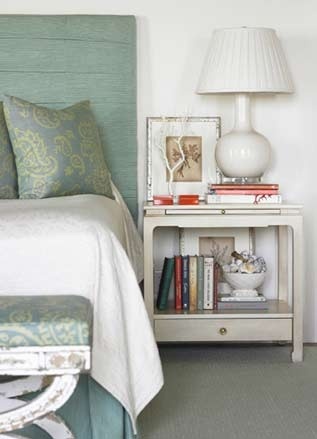 This vignette was designed by Suzanne Rheinstein, who often uses pleated lampshades in her layered designs. 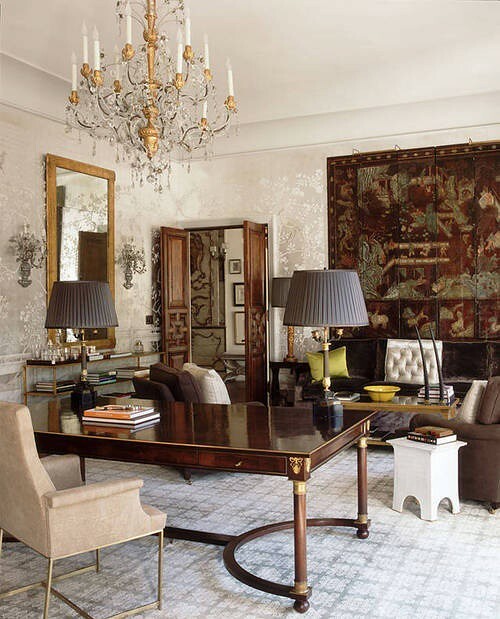 One of my favorite rooms by Suzanne Rheinstein – it’s so beautifully composed. Note the elegant tall lamps with the pleated lampshades. Image via Architectural Digest. 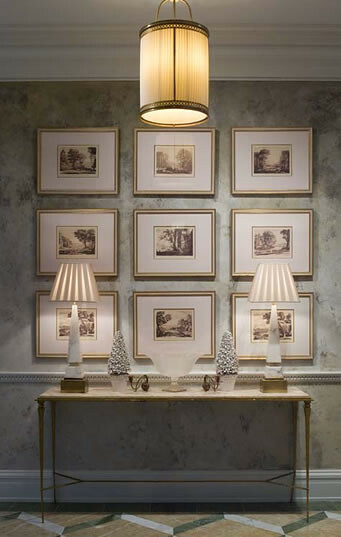 Another Miles Redd design, with traditional lamps and shades flanking the softly abstract art. 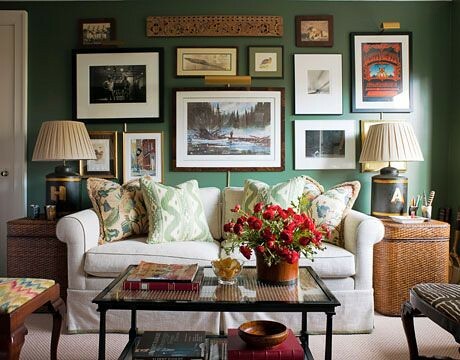 I must admit, I love it when the art is custom created as a design element of the room, pulling in all of the colors. A warm and cozy den by Ashley Whittaker – the pleated shades make a cozy room even cozier. A favorite scene from Mrs. Howard – the lamps and shades are perfect for the space. 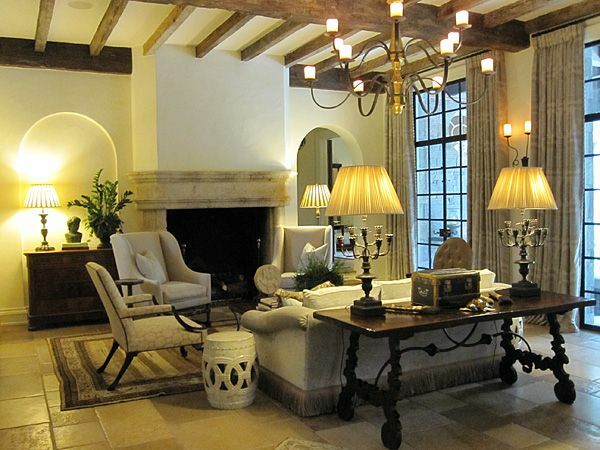 A Phoebe Howard design again – the lamps and shades are one of my favorite touches in this room. I had a feeling that Loi from Tone on Tone might have a pleated lampshade or two in his own home, and sure enough, he does. This is my favorite picture from the Traditional Home article featuring his house in DC. Jackye Lanham uses pleated shades quite a bit in her designs. This image came via architect Bill Litchfield’s website. I need to cut off somewhere, and this ia a great place to stop. 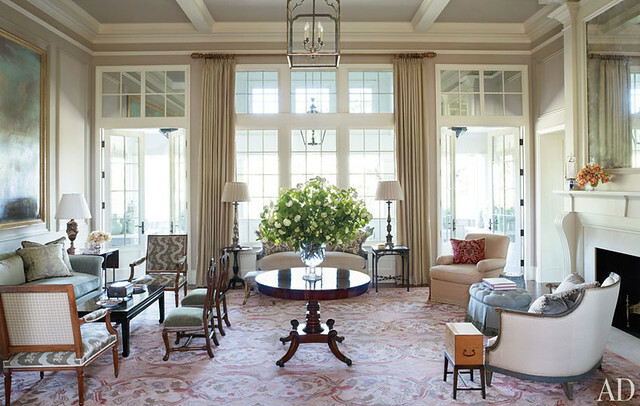 One of my favorite rooms by Jackie Lanham. Note the intricate details of the pleated lampshades that she uses with the simple cream ceramic lamps. Here is a fantastic blog post I found on lamp shades through the decades, with pictures from every era. http://designfabulous.com/tag/lamp-shade-trends/ This blog author gives the stamp of approval to pleated lamp shades as long as they are box pleats (which is the style I like) – she calls box pleat shades the perfect marriage of the feminine and the masculine, and a fit for any design style. So, what do you think of box pleat shades? Do you think they are hopelessly out, or do you think that they are a classic? Clearly, I am a huge fan and think they are a classic. What style of lampshade are you liking these days? I am also curious if you ever replace the standard lamp shade with a custom made shade. Very classic! Beautiful photos of lovely spaces. I think the box pleat shade will always have a "place" in decor! I think they are classic but looking to fussy for the styles now. 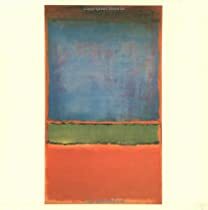 In almost all the samples you showed above I think I would have preferred a simpler shade. That said...I'm a huge fan of a shade with a pattern to it. Many of my lampshades I've recovered in patterned fabric. To me right now pleated shades look dated. But everything comes back around. And I am not one to ever contradict Ms. Howard! She knows what she is doing. I think in the interest of saving $ and also the popularity of DIY, boring and plan lampshades took the place of beautifully detailed shades like the ones you have shown. Lamp shades are one of those small details that I think often get overlooked in the overall decorating of a room but I enjoy a beautifully pleated shade or other custom work such as a hand-painted or embellished shade. Fortunately, sites like Etsy offers lots of fun ideas at reasonable prices. Gorgeous, Holly! I love a pleated shade, but haven't been able to make the barrel shades fit in my own home. The images you have shared are stunning. I will be pinning a few of these. I think it depends on the room. Also, what is available in a city often dictates styles. I used to live in Houston, and don't recall seeing many pleated shades. 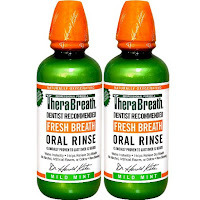 I now live in Atlanta, and I see them in many stores. There are many lighting stores that stock pleated shades almost exclusively, so that might be the local preference. Many of the designers you featured are from Atlanta. I think the pleated shades are timeless and classic. I have a lighting and lampshade store, and currently sales are running about 60% pleated and 40% flatcover/hardback. I've found that the best line out there right now is a relatively new line called International Shades, and they have both pleated and hardback shades in linens and silks. Quality is best I've seen...and great customer service whether you're a designer or storefront. I'm just always a sucker for classic, timeless styles that avoid fads. 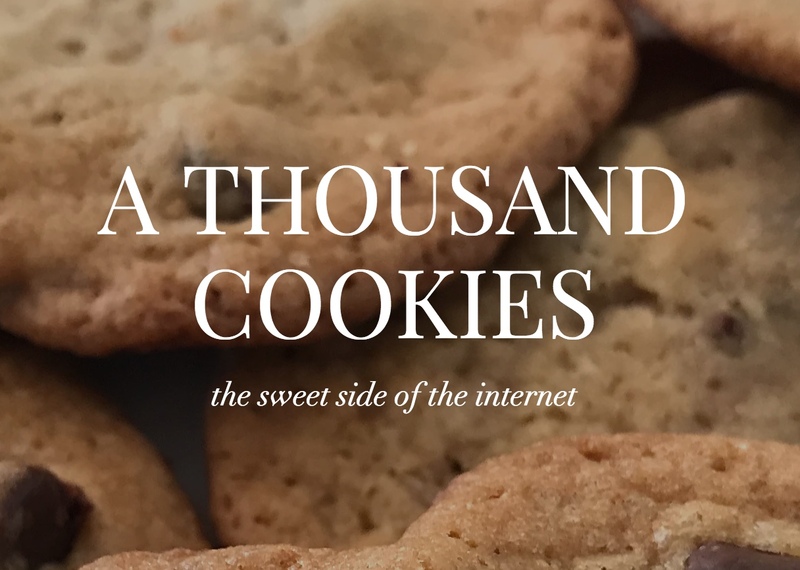 Loved the pictures in this blog post. Holly, the Belgian designer Natalie Haegerman creates her own pleated shades similar to the ones you've here. I like the look, but I also like the plain drum shades as well. 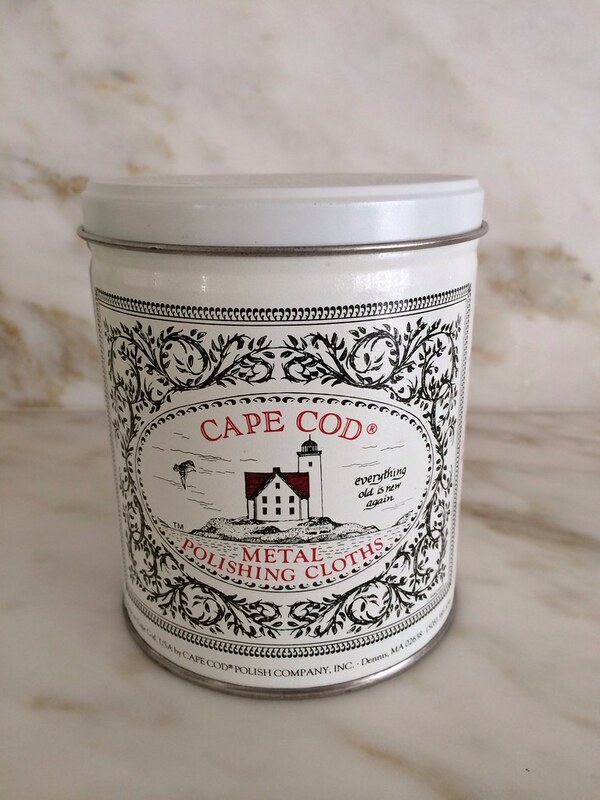 I think you have to have them paired with somewhat contemporary furnishing to keep from looking like Grandma' house. Many of the shades in this post were made by Lux Lampshades, my favorite source for custom and hand crafted shades. This is one spectacular post! So many of my favorite rooms. I do like them and have a few myself, it gives a lamp a very custom look. Gorgeous post! I agree pleated shades are a classic. I'm sure many will find them too traditional, but they are beautiful. I think they also add some texture and visual interest to a room. THese are fabulous examples. I love some of them with big pleats. Cheap shades don't do any interior justice! I still love pleated shades, but I've also seen and purchased a couple of the drum shades. What pretty rooms you've shared. Great food for design thought. What a fabulous post Holly! I know how time consuming it is to put these posts together and this one kept going and going (much to my delight!) So many beautiful images you have compiled here. And yes, I think that pleated shades are an enduring classic! I love pleated lamp shades! Always! (probably because they're expensive) My life would be easier if I loved drum shades, but I just don't. Oh, this is one of my hot buttons for sure. Count me as a pleated shade fan. I will be soooo glad when the drum shade trend fades away for another few decades. So hard to find a pretty lamp these days because as you said, they are decked all out with drum shades. Besides the fact I just don't care for the look of the drum shade AT ALL (yes, that's totally personal preference) I hate how it does nothing to shield your eyes from the harsh light emitting from the top of lamp as you walk near a table beside a sofa or chair. I much prefer a tapered shade for appearance sake and for comfort from the light bulb glare. The pleated shade is classic and I do love it. I will check out Mrs. Howard for the box pleated...beautiful design! I really enjoy box pleated empire shades as pictured. 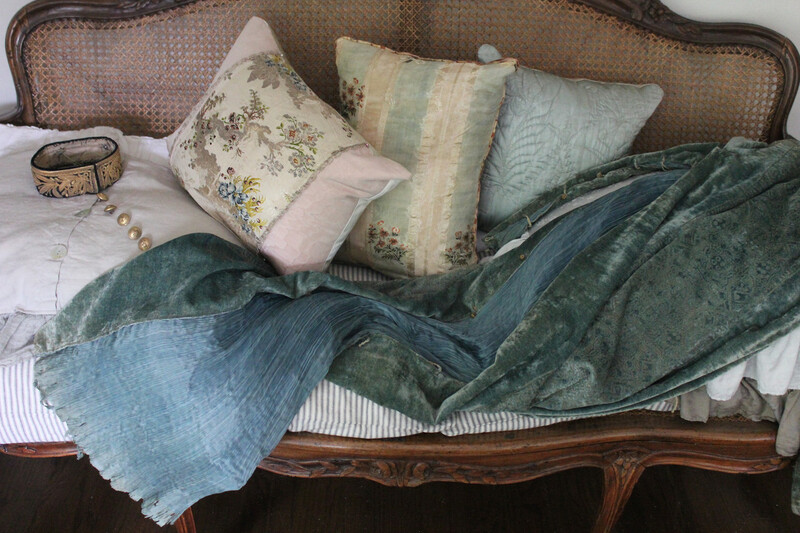 I think the folds of fabric add a crispness and an element of texture to a room. Even standard mushroom pleats are beautiful. However, I also own drum and bell shades. I think the beauty is really in the mix and layering.